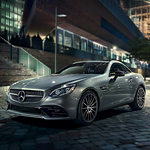 The Mercedes-Benz SLC 300 is one of the most sought-after convertible roadsters in production today. With its sleek silhouette and comfortable interior, it's easy to see why. This car, however, also packs a ton of power. The SLC roadster seats two adults. It has a 2.0 L inline 4 engine that cranks out 241 hp and 273 lb-ft of torque. The SLC 300 features a 9-speed automatic transmission with rear wheel drive. And in spite of all this built-in power, this roadster gets an estimated 32 mpg on the highway. Powerful, efficient, and comfortable: what could be better? The Mercedes-Benz SLC 300 requires premium fuel, high performance tires, and drivers who love to really feel the road beneath their tires. This is an incredibly fun car. If you want to get behind the wheel of the SLC 300, come and see us at Mercedes-Benz of Fort Wayne. We'd love to take you for a test drive.